What Drives Population - Food or Energy? A common assumption among population analysts is that food availability is the main driver of population growth. In fact, most will go so far as to define the carrying capacity of an environment primarily in terms of the food that it offers to the population under consideration. I have two major problems with this approach to population and carrying capacity, as outlined below. My first objection is that this approach treats carrying capacity as a variable, and the expansion of agriculture as an increase in carrying capacity. This requires a definition of carrying capacity I do not subscribe to. The definition I am most comfortable with is, "The population level that an environment can support over the long term without damaging the ecology of the environment". An expansion of agriculture does not meet this definition because putting new land under the plow or increasing the production of existing farmland affects habitat, biodiversity, water levels and soil fertility among many environmental factors. In effect the expansion of agriculture requires that we draw on the natural capital of the environment. The repayment of this withdrawn capital does not enter the ecological equation as it should. The result is, by definition, not sustainable. In fact, the form of organized agriculture (which I have heard playfully called "totalitarian agriculture") practiced for the last ten thousand years is by definition unsustainable, especially when you consider that virtually all of the arable land on the planet is now under cultivation. Now, my definition of carrying capacity may be too strict and may be disputed by other ecologists, but it's the one that seems most comprehensive and reasonable to me. My second problem is that energy is never mentioned in mainstream analyses that focus on food. The possibility that this omission may be wrong-headed is hinted at by the well-known studies that found 7 to 10 calories of fossil fuel embedded in every calorie of food we eat. 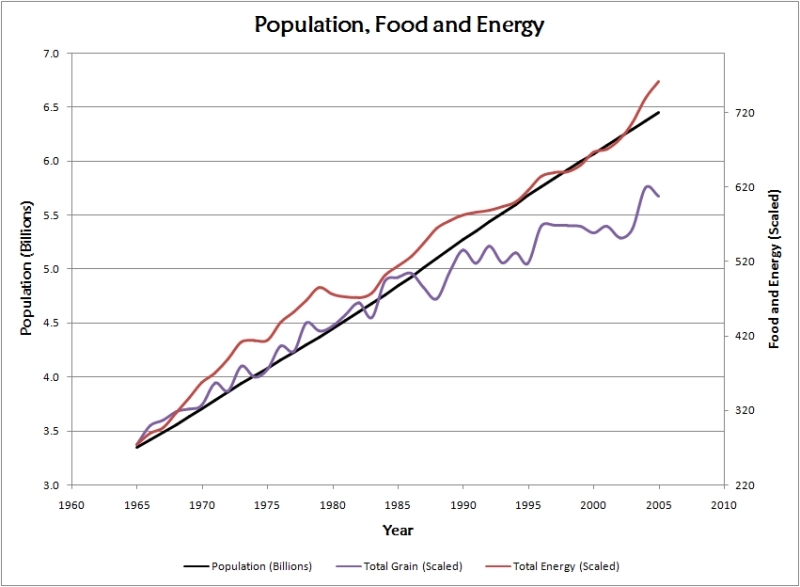 In fact, I have developed a strong suspicion that rising per capita energy consumption has even more to do with population increase than rising food production. To investigate this possibility I created the graph below. It shows population, grain consumption and primary energy consumption from 1965 to 2005, all scaled to allow a visual estimate of correlation. I know this is not rigorous, but the differences in correlation are obvious to the eye, and to me energy consumption shows a better correlation with population growth than does per capita food consumption. For the moment I am content that anyone who is analyzing population drivers without taking energy consumption into account is missing a large and crucial part of the story. The implications of this finding for the future of population growth seem obvious. In other articles I have stated my position that Peak Oil may precipitate a decline in human numbers. The message of the correlation shown above is that if rising energy use is a significant driver of population growth, falling energy use will probably result in a drop in population. The mechanisms for this will be quite varied. They will range from declining agricultural productivity and distribution to breakdowns in urban sanitation infrastructures and problems with national electrical supplies. No matter what the proximate causes of human deaths may be, however - starvation, disease, exposure or heat stroke - the root cause will be declining energy supplies. The other significant implication is that improving humanity's energy supply picture will not halt population growth. It would certainly not curb it until the bulk of the world's population had achieved the per capita consumption of the developed world, where Total Fertility Rates have finally declined below replacement rates. This is, of course, just a restatement of the Demographic Transition Model into energy terms, away from the commonly assumed proximate cause of industrialization. Analyzing the amount of energy it would take to stabilize the world's population through this mechanism yields a discouraging result. If we were able to ramp up to three times our current energy output, we could stabilize the world population at 10 billion by the year 2050. This begs the question of where that energy might come from. It also forces us to think about the environmental damage resulting from its production, and most especially the continued (final?) destruction of an already overstressed planetary ecology by a population two thirds larger than today's, all consuming resources and generating wastes at the same rate as today's Canadians, Europeans, Americans and Australians.